Christians in Nepal are alarmed over attacks against their communities and other religious minorities by Hindu extremists during the last two years. As they anxiously wait to see whether extremists will follow through on their threats, we need to speak up on their behalf to ensure that Nepali authorities take these matters seriously and bring those who are making such threats to justice. On July 1, 2008 a Catholic priest, originally from India, was shot by masked men in the middle of the night at the mission compound of his religious order. That attack appeared primarily targeted at Christians of Indian origin, but another bomb on May 23, 2009 at the largest Catholic church in Nepal left 2 dead (including a teenage Nepali girl and an Indian newly-wed visiting Nepal on her honeymoon) and over a dozen injured, one of whom also later died. Other incidents include attacks against two mosques that left two Muslims dead. 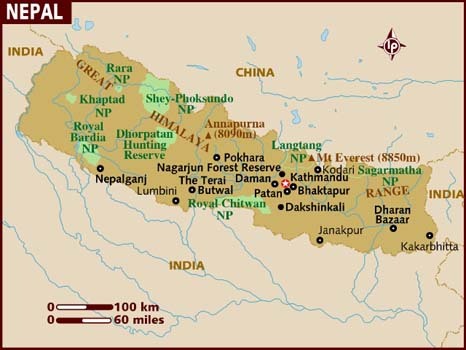 Nepal is located between India and China and is best known as the home of Mount Everest, the world’s tallest mountain. The majority of its population of about 28 million consists of roughly 80% Hindus and 10% Buddhists. The remainder includes 4% Muslims, some 2.5% Christians, and practitioners of other, mostly local and traditional religions. Until recently the country was a monarchy and the only officially Hindu state in the world. It is also the birthplace of the founder of Buddhism and has not historically been known for religious conflict. Politically, on the other hand, Nepal has not been without its share of instability which culminated in 2006 when the king was forced to step down under pressure from pro-democracy forces. The Hindu state was promptly declared a secular republic and the Communist Party of Nepal (Maoist) (which had fought a 10-year guerrilla war against the government earning designation as a terrorist organization from the United States’ State Department) secured its influence by emerging from elections in early 2008 as the strongest party. The recent attacks have been linked to an organization called the Nepal Defence Army (NDA) which was unknown before 2007. The NDA claims to be seeking the return of the monarchy and the re-establishment of Hinduism as the official religion of Nepal and has claimed to be training suicide bombers. Shortly after the May 23rd attack, threats attributed to the NDA asserted that if Nepal’s million or so Christians did not stop their activities and leave the country within a month, a million bombs would be placed in churches across the country. Nepali Christians are taking the threats seriously and, with the deadline to run out within a matter of days, we must act quickly to support them. Nepali Christians are fearful over these threats and about increased acts of intimidation and extortion by the NDA, other extremist groups, and criminal gangs. These groups are mostly active along the southern border where they receive support from extremist Hindu groups in India. Since the May 23rd attack one woman has been arrested after allegedly confessing that she left the bomb, but Christians are concerned that this is merely window-dressing and have expressed dissatisfaction with the government’s ineffectiveness against those responsible and the leaders of these groups. While Christians have not been the only victims, the May 23rd attack and subsequent threats have changed the scenario and security around churches has become a necessity. In addition, Christians are also worried about their future under a government dominated by Maoist communist forces and hoping that the influence of atheists does not lead to increased pressure against religious expression and worship. • that those responsible for the threats and attacks against Nepali Christians and other minorities would see the evil and futility of their actions and allow their fellow citizens to live and worship in peace regardless of their beliefs. Pray also that they would come to know true peace themselves through a personal relationship with the Prince of Peace. • immediately to your Nepali embassy, requesting that authorities take these matters seriously and take strong, effective action to bring those responsible to justice and to ensure the safety of Nepali Christians in light of the threats that action would be taken against them in the coming days.